Are your member of professional organization? What are your working days and hours? Is it true hardwood floors are better for people with allergies and asthma? How long does it take to sand and finish my old floors? Is it very dusty? I've heard about this new dustless sander? Will I need to stay out of my house during sanding? Do you come in and move my furniture? Do you remove old carpets, vinyl tile and staples? I have found some black stains under where the rug used to be and I am worried if they can be sanded out. Do we need to be here when you are working or can the work be done while we are on vacation? What exactly is "Screening" the floor? How do you know if your floor only requires "Screening"? How much does it cost to sand and refinish, and do you charge by the room or square foot? What's the difference between oil-base and water-base (latex)? Can I get some references? My floors have some gaps in between the boards, mostly in the heating season, is this normal or should I be concerned? What are your terms and payment options? What is the best way to care for my wood floors, once they are done? Q. Are your member of professional organization? Q. What are your working days and hours? A. We normally work Monday through Saturday for 8-10 hours. Q. Is it true hardwood floors are better for people with allergies and asthma? A. Yes. Allergists recommend that people with allergies live in an environment with wood floors, which do not hold dirt, dust mites and mold. In the Northwest, many hospitals have installed wood floors in their birthing rooms because of a sterile environmental and sterile benefits. We receive lots of feedback from customers that have us remove their rugs, and they can't believe the difference. Q. How long does it take to sand and finish my old floors? A. Most jobs take 2-4 days from start to finish. Staining adds 1-2 day. Then we recommend waiting a couple of days before resuming heavy traffic and replacing furniture. Q. Is it very dusty? I've heard about this new dustless sander? A. As far as these new "dustless systems" are concerned if it sounds too good to be true it probably is. We take care to put up plastic to contain the dust in the areas in which we are working. Most people find that dust is not very bad. Q. Will I need to stay out of my house during sanding? A. The process is very loud and finishes contain strong chemicals. We recommend leaving your house, unless you have separate floor to stay or very large home. Q. Do you come in and move my furniture? A. We normally do not move your furniture. Moving furniture is the customer's responsibility, due to insurance not covering us for injuries or damages sustained while moving furniture. Q. 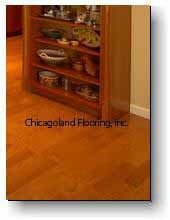 Do you remove old carpets, vinyl tile and staples? A. Yes, we can help you with this very unpleasant job. You need to contact your waste disposal company if they pick up the old carpets and under what conditions. In some suburbs around Chicago, you need to pay for it additionally. Q. I have found some black stains under where the rug used to be and I am worried if they can be sanded out. A. Black stains are water or pet stains. Pet stains and large water stains normally do not come out during sanding. One option is to replace the damaged boards or stain the whole floor with darker color if stain is very large. Q. Do we need to be here when you are working or can the work be done while we are on vacation? A. Vacation is the ideal time to have this work done. Especially if someone in the house is highly sensitive to the smell of polyurethane, or perhaps someone is allergic to dust. But even if you are staying in your home, we can work out a schedule to fit your needs. Q. What exactly is "Screening" the floor? Q. How do you know if your floor only requires "Screening"? A. Screening can be done providing the floors never had wax applied to them. (wax includes pine oil, pledge, endust, Murphy's oil ). Also screening will not get any dirt out of the pores of the wood. If you are down to the bare wood and dirt went into the cells of wood you will need to sand entire floor. Which is why the screen and re-coating is a great low-cost way to keep your floor looking brand new. Q. How much does it cost to sand and refinish, and do you charge by the room or square foot? Q. What's the difference between oil-base and water-base (latex)? A. Oil-based poly-urethanes contain solvents which can take a little longer to dry. The oil-base, provides the more "traditional warmer look". The makers of latex finishes are jumping leaps and bounds in making the product more durable, and we do have a growing number of customers that want the "lighter look" and who want to use it because it's more environmentally safe. So whichever finish suits your needs, we can work with you to maintain your wood floor so that it lasts a lifetime. Q. Can I get some references? A. Sure, click here for some. However, we keep our customer data confidential, Without prior approval we do not give names and phone numbers of our customers..
Q. My Floors have some gaps in between the boards, mostly in the heating season, is this normal or should I be concerned? A. Wood flooring expands and contracts with temperature and humidity changes, so therefore it is perfectly normal to experience some shrinking in the dry seasons and perhaps a little cupping in the summer wet season. (July-Sept). Q. What are your terms and payment options? A. We require a deposit of 50-70% down prior to beginning for sanding jobs. For installation jobs deposits are higher to cover costs of the flooring. We gladly accept Checks or Cash. Q. What is the best way to care for my wood floors, once they are done? A. Check our Maintenance page.